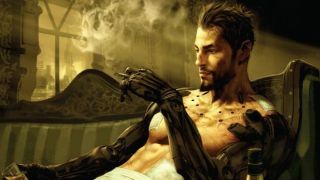 If you've tuned into Deus Ex: Human Revolution's entertaining and insightful director's commentary you'll have a sense of Jean-Francois Dugas and Jonathan Jacques-Belletete's ability to laugh about their own project. Now you can experience that in video form with this 42-minute let's play, featuring canny observations about Jensen ("his shoulders were so damn wide") and cut environmental details ("this is where we used to have George Bush's face"). It's good fun. There's a Mankind Divided tease hiding in there too, relating to your VTOL pilot, Malik. "Speaking of Malik, a lot of people are so bummed that we're not bringing her back in the stuff that we've shown yet of Mankind Divided. How come she's not your new pilot?" TIME WILL TELL. Human Revolution's dynamically lit, high-poly, slim-shouldered sequel is due out next year. You can watch 25 minutes of in-game footage right now.